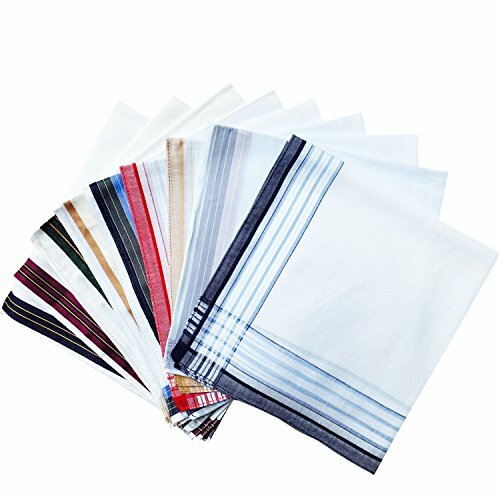 Assorted Pack of Mens White Color Border Cotton Handkerchiefs by MileyMarla at Mas Fashion. MPN: 43206-114793. Hurry! Limited time offer. Offer valid only while supplies last. Specifications:100%Cotton Handkerchiefs HankySIZE-40CM/16 Inch SquareMileyMarla promises to delivery quality products at a truly affordable price. MileyMarla promises to delivery quality products at a truly affordable price. These handkerchiefs will make a Perfect gift.100% Cotton Hankerchiefs, soft and smooth handfeel. Should any doubt or problem please feel free to contact us at anytime.Our Team will try best to solve the problem together with you.Thank you for your visit and Support! Perfect for gentlemen, grandfathers, dads, birthdays as special. Great Eco-friendly accessories for daily use.Whether it as classic Pocket Square or Wedding Hankies you're looking for,This Style Handkerchiefs do it all. If you have any questions about this product by MileyMarla, contact us by completing and submitting the form below. If you are looking for a specif part number, please include it with your message.